Thanks Mom: The beginning of this book makes a special call out to my papa bear, but it was my mother who offset all of my father's wild ideas, and my own. Kyla Gutsche: For the years of torment you provided as my older sister, but also for add- ing the spicy renaissance to the prose of this book. 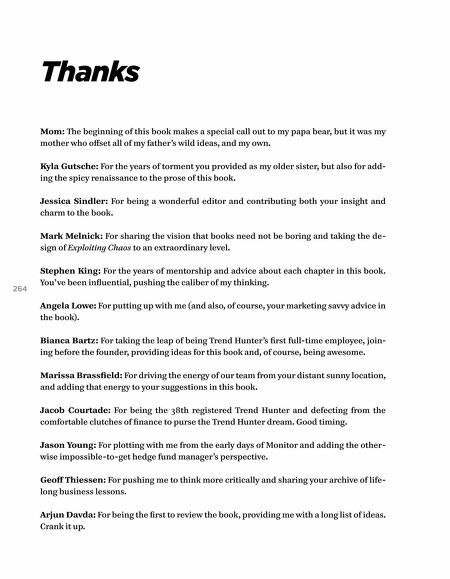 Jessica Sindler: For being a wonderful editor and contributing both your insight and charm to the book. Mark Melnick: For sharing the vision that books need not be boring and taking the de- sign of Exploiting Chaos to an extraordinary level. 264 Stephen King: For the years of mentorship and advice about each chapter in this book. You've been influential, pushing the caliber of my thinking. Angela Lowe: For putting up with me (and also, of course, your marketing savvy advice in the book). Bianca Bartz: For taking the leap of being Trend Hunter's first full-time employee, join- ing before the founder, providing ideas for this book and, of course, being awesome. 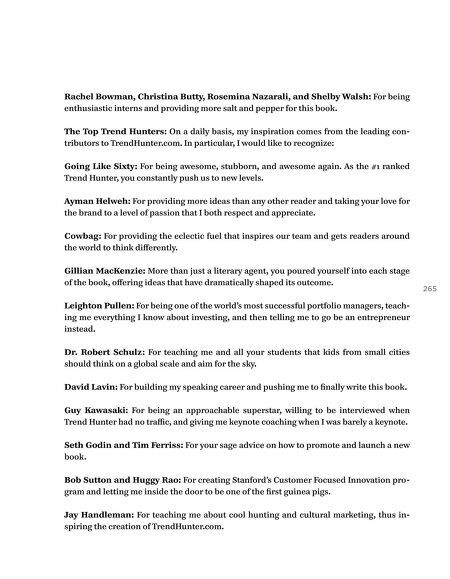 Marissa Brassfield: For driving the energy of our team from your distant sunny location, and adding that energy to your suggestions in this book. Jacob Courtade: For being the 38th registered Trend Hunter and defecting from the comfortable clutches of finance to purse the Trend Hunter dream. Good timing. Jason Young: For plotting with me from the early days of Monitor and adding the other- wise impossible-to-get hedge fund manager's perspective. Geoff Thiessen: For pushing me to think more critically and sharing your archive of life- long business lessons. Arjun Davda: For being the first to review the book, providing me with a long list of ideas. Crank it up.